Berlin Tegel “Otto Lilienthal” Airport is the gateway to the progressive city of Berlin and Germany. The area of Berlin Tegel Airport was originally part of Jungfernheide forest, which was used as a hunting ground for the Prussian nobility. Air France was the first airline to commence regular commercial flight operations at Berlin Tegel Airport on 2 January 1960. Berlin Tegel Airport recorded 20.7 million passengers passing through its doors in 2014. Berlin Tegel Airport (IATA code: TXL) is the main international airport in Germany, and the hub airport for Air Berlin. Flights to Berlin Tegel Airport are provided by international airlines such as South African Airways, Lufthansa and Swiss International Air Lines. TXL is a 30-minute drive or a 20-minute train ride to the city centre of Berlin. Book your cheap flights to and from Berlin Tegel Airport! Berlin Tegel “Otto Lilienthal” Airport is named after the German pioneer of aviation. The fourth largest airport in Germany, Berlin Tegel Airport sees over 20 million passengers annually. 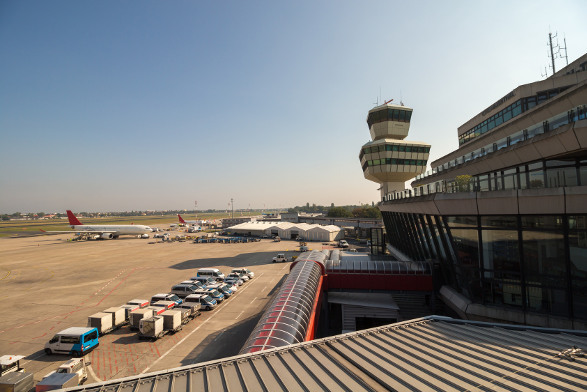 Berlin Tegel is renowned for its hexagonal main terminal building around an open square. During World War I, the area where the airport is based, was used for military training of aerial reconnaissance crews. Berlin Tegel Airport features flights to many European destinations and intercontinental routes. Berlin Tegel Airport has an amazing range of food and drink options. From healthy take-out to bistros, you will find sensational cuisine. Bakeries, coffee shops, bars, and restaurants are located at the Berlin Tegel Airport terminals. Indulge in some epic retail therapy while browsing through the shops at Berlin Tegel Airport. Aside from incredible duty-free shops, there are electronic, accessories, books, gifts, travel essentials and clothing stores. Berlin Tegel Aiport’s international departures lounge is located on the airside in Terminal C. The lounge is spread over three floors. Passengers travelling with Air Berlin can access the lounge free of charge. Berlin Tegel Airport has an awesome range of facilities, including banking, a hair salon, luggage services and a post office. Gold Inn Alfa Hotel is a family-run establishment with a 3-star comfort for passengers to enjoy. It is a 15 -minute drive from Berlin Tegel Airport. Amenities include free Wi-Fi, bicycle rental, laundry and on-site parking. This 4-star hotel is a comfortable stay located near to the exhibition centre and City West. It is a 10-minute walk from Berlin Tegel Airport. Amenities include free Wi-Fi, a bar, a sauna, outdoor pool, and meeting rooms. Central-Hotel Tegel offers sensational rooms, it is located near Lake Tegeler See. Central-Hotel See is a 10-minute drive from Berlin Tegel Airport. Amenities includes free Wi-Fi, family rooms and breakfast. Travellers can purchase their foreign exchange online, 60 days before departing South Africa. The following documents is required to order foreign exchange. Bank branches and foreign currency exchange services are present in the halls and terminals. There are long term and short-term parking options available at Jomo Kenyatta International Airport. Airport patrons can use Park ‘N Fly – shuttles are provided every three to five minutes, shuttling customers to and from the airport. Berlin Tegel Airport is located 8 km northwest of the city centre of Berlin. Trains, buses, Uber, metered taxis and car sharing options are available to transport you from the airport to your destination.